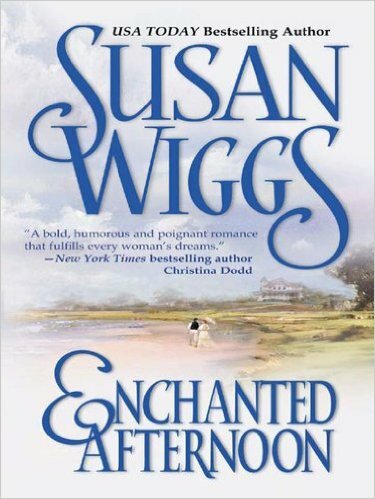 Enchanted Afternoon almost counts as an Old School Romance, being written in 2002. It’s the unusual story of Helena and Michael, Helena’s journey to running a turn-of-the-century domestic violence shelter and how they created family out of their bare hands. It’s also one of the most pro-women novels I have read in a long time. Things we learn about in this book: how women were sent to mental institutions – “sanitariums” – whenever their husbands couldn’t “handle” them any more. One woman Helena meets is weeping and obviously lactating. It turns out the woman had delivered a stillborn child three days previous and couldn’t stop crying and hadn’t spoken from her grief. Her husband took her to the sanitarium to sort her out. Charming, eh? We are reminded over and over and over again how the plight of women is not an easy one. Wiggs dramatically demonstrates how they were often regarded as little more than the property of their fathers or husbands. I think today’s Western women can so easily forget how hard fought the victories we have had were. We have miles to go to achieve full equality, but I think this is an important book to show how far we’ve come. I would, in fact, use this on a syllabus of recommendations for a gender studies class. The romance is great – unconventional and surprising. Helena is not a typical romance heroine and I love her for it. She starts off married and is seeking a divorce from her douchecanoe of a husband. Michael is someone she was connected to her in past that she seeks out to help her with that process. There’s Helena’s precocious wee son and a various cast of strong women who journey through the story. Reading sets me free – quite literally. I was destined for a life of millwork in Five Points, on Manhattan. Imagine standing at a machine loom, in an unheated factory twelve hours a day at a stretch, turning out clothes for women who wouldn’t give you the time of day if you asked them at high noon. All the girls from my tenement either turned to factory work or prostitution. Those were the only choices available to a girl with no family, no money, no prospects. So I taught myself to read to keep from dying. That hit me in all the feels. I was taught to read early and it was heavily encouraged in my family – to the point where I was never denied a book I wanted and still live in amongst piles of the printed word. Nellie’s word revived that feeling in me that reminds me that reading is one of the greatest gifts we have. Additionally, there are not enough historical romances set in the U.S. that aren’t Westerns, so I am thrilled to have this one set in upstate New York at the end of the 19th century. Tea is the only drink I would imagine Helena being okay with serving in her living room but I would think Michael would be partial to a good glass of American bourbon, so we’ll give both a recommendation for this novel. Seneca Falls Convention: If you’re not familiar with the event which started the women’s equality movement, then you should be. 69 Books Every Feminist Should Read: This list from Bustle can help you form your TBR list! I got a copy of this book from my local library’s eBook collection. Books with Children, Bourbon, Historical, Romance, Small Town, Tea, Teachable, U.S.